The “global village” is a messy place. It began messy, and it will always be messy. In Puebla, Mexico City, and on presidio’s across Mexico during the early 1500’s, Humanist Italian trained Christian Spanish potters working in the Islamic Arabian style of copying Taoist Chinese porcelains incorporated Aztec Mexican flora and fauna imagery onto their pottery. Before then, no body of work combined so much direct influence from such a wide geographic and cultural web. It gets messy, though. How much does knowing the whole story behind a work of art influence our appreciation for it? To make this pottery the Muslims had to be evicted, the Aztecs wiped out, the Chinese pulled apart, the Spanish bankrupted, and the Italians sidelined. Few pottery types illustrate such messy but important questions well as Mexican majolica does. Can (should) these sorts of questions be carried over to today? For example, how do we reconcile the final product we produce with the strip mining and horrendous labor exploitation involved in bringing us many of our raw materials? These aren’t the kinds of things most people think of when considering ceramics, but they exist just the same. 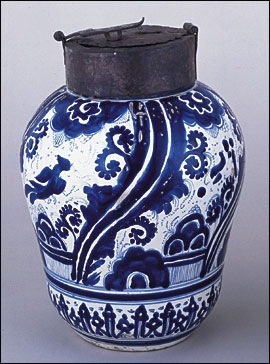 The western hemisphere’s first glazed, blue and white pottery was an impressive achievement, and an important milestone. Fascinating, but messy. You are currently browsing the archives for the raw materials category.